Get Claim Submission Results INSTANTLY! Submit claims in real-time through 100K+ edits to ensure faster payments. Know exactly where the claim is and the status. Choose the Best EHR for YOUR Practice! Choose the best of breed EHR to go along with our best of breed PM/Billing Solution. Run any of our standard reports or build your own custom reports with drag and drop. At CollaborateMD we are obsessed with getting your medical claims paid fast. We are constantly enhancing our innovative and intelligent cloud-based medical billing software to make sure your claims get to the medical insurance payer as quick as possible and get paid. We consider each customer a partner and you can trust that we do everything in our power to make sure you are successful. At CollaborateMD 90% of the medical practices using our healthcare management software solution are the 1 to 20 provider medical practice. The reason we have so many small to medium sized practices is because our affordable and easy to use solution truly fits their needs. Our prices start at $179 per month with no set-up fees. CollaborateMD was created in 1999 to provide the small to medium practice with a software solution that truly provides a return on investment. When you join CollaborateMD, you will become more efficient, decrease rejects, speed up the payment cycle, and enjoy the freedom to access your data from any Internet enabled computer. Real-Time Claim Submission gives you on-demand visibility into your claim and enables real-time results. No more waiting until the next day to see claim acceptances or rejections! View 125+ report templates and modify them with the ease of drag-and-drop fields, filters, grouping, and charting, allowing you to view the financial performance & health of your account. Streamline front office registration and payment processes with our integrated Payment Processing and Payment Portal, designed to help your office staff work more efficiently and accurately. CollaborateMD medical billing software generates patient and payer collection worklists with automated, prioritized follow-up tasks that boost your collections productivity and improve financial performance. Our appointment scheduler can be easily customized to fit your needs in addition to configuring scheduling rules that will help maximize the physician's time, while optimizing your front-office and back-office workflow. Our customers work less and get paid faster thanks to our 99% First Pass Claim Acceptance rates, 29% higher than the national average! You too can experience exceptional first pass claim acceptance rates (FPA) with CollaborateMD. Over $66 Billion in claims & over 23 Million patients have been entered into CollaborateMD! We have been listed in the Inc. 5,000 seven times. Calculate how much you can get paid more and faster in just minutes with our CMD Revenue Calculator! Our CMD Revenue Calculator will show you how our solution can advance your practice's financial goals. Answer the five simple questions below to gain an understanding of how CollaborateMD can improve your revenue as a result of our FPA rate of 99%! *Industry averages for First Pass Acceptance rate are between 79%-85%. Simple and affordable pay-as-you-go pricing plans with no setup fees enable your practice to save time, increase efficiency, and get paid faster! CollaborateMD helps you get your customers paid faster, manage multiple accounts with ease, set users permissions for individual customer accounts, file claims with minimal rejections, and more. Get Healthcare's best cloud-based billing solution for starter practices and start off on the right foot when it comes to saving time and getting paid faster. Brand Ambassador Referral Bonus Back up to $400! Version 10 Beta Release is Here! 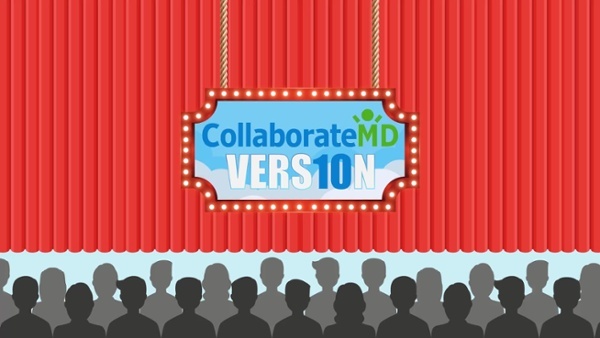 We're proud to announce that Version 10 of CollaborateMD has arrived! Countdown to Version 10 Beta Release! CollaborateMD is fantastic. Even I was able to understand and use it quickly with the help of my Great trainer. I have used other systems including Kareo and CollaborateMD is so much easier to use and has more features. I've been using CollaborateMD for almost ten years. The improvement and innovation has been exceptional. I've worked with at least five different software products over the years, and CollaborateMD is by far the most open to enhancement requests. That is what is making CollaborateMD a leader in the industry. I would like to say that your support staff is very patient and helpful. I know that I will get the help I need even if it takes an hour to be explained. The program is great and the support teams make it that much better. My entire experience with CollaborateMD and its staff has been truly wonderful! It is excellent software at a great price! I have had the opportunity to work with both Irene and Tanya, and many others who have been great to work with; I couldn't ask for a better representative and support specialists. They are fast and knowledgeable about the software and its capabilities. I have worked with other billing software companies and their staff, and none of them compare to CollaborateMD and its staff. I would highly recommend it!